The right people found him just in time. 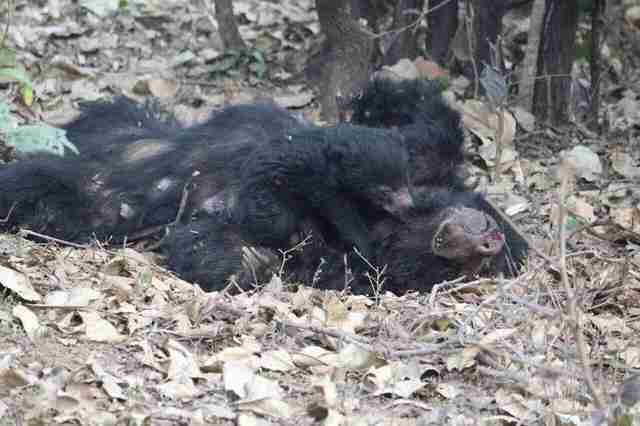 The sloth bear cub clung to the body of his dead mom and refused to let go, even when her body became stiff and cold. Poachers had killed his mom. They'd set up a high-voltage wire at the edge of a tiger reserve in India, and the mom had wandered across it. She died almost immediately from electrocution, according to the rescue group that found the pair. Somehow, the baby cub survived. When rescuers found him, he was still nursing from his mom's dead body. 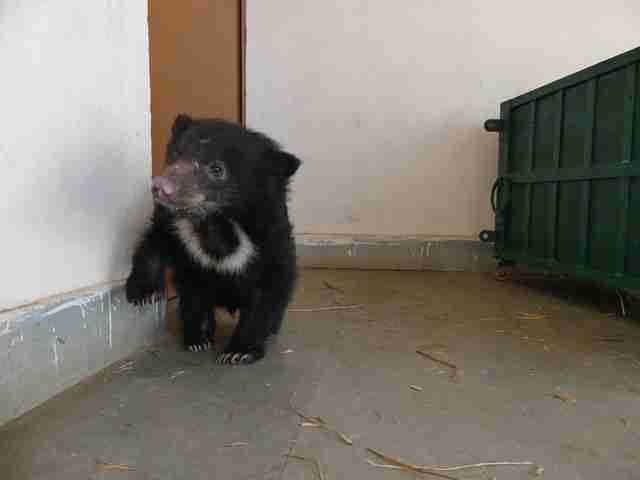 The rescue team took the baby bear, who remains unnamed, back to Agra Bear Rescue Facility (ABRF) in Uttar Pradesh, India, a rescue facility run by Wildlife SOS and International Animal Rescue (IAR). "The young bear is currently extremely traumatised and will need to be kept under constant observation by the medical team," Dr Amol Narwade, a vet who works at the facility, said in a statement. In India, sloth bears face huge challenges. Habitat loss and poaching are two of their biggest threats. "Poaching poses a real threat to wild sloth bears in India, particularly as human populations are encroaching more and more into their natural forest habitat," Lis Key, PR and communications manager for IAR, told The Dodo. "As a result, bears and other wildlife are left exposed and vulnerable - and struggle to find food in their dwindling territory. Wild animals then stray into villages and onto farmland in search of food, trampling or eating people's crops." 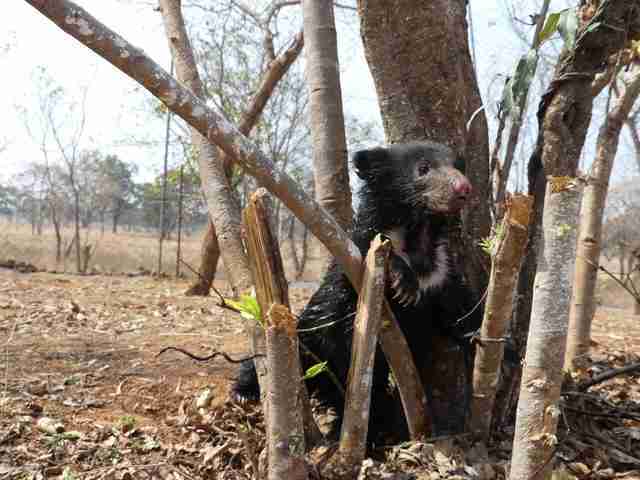 "In retaliation, people set snares for wildlife and trap all kinds of unwitting victims such as pigs, deer and, as in this case, wild sloth bears," she explained. "Whatever the animal, the poachers eat them as bushmeat." Sloth bears are also commonly used as "dancing bears" for human entertainment - or for the cruel practice of bear baiting, where people make dogs attack bears to make the dogs more aggressive. "Had the mother and baby bear not been discovered [by the rescuers], it's likely the poachers would have eaten the dead female and perhaps taken the baby to sell on for baiting or bear dancing over the border in Nepal, where the laws are more lax," Key said. "Bears are also vulnerable to being caught for their body parts for use in traditional medicine." Despite poaching being a common issue, this is the first time IAR has ever encountered poachers using electrocution, according to Key. "I believe it is more common for poachers to set plain wire snares or shoot wild bears, and in the past we have had to deal with victims of both," Key said. But there is good news. The six men involved in this poaching incident were caught, and are currently awaiting trial, according to the IAR. 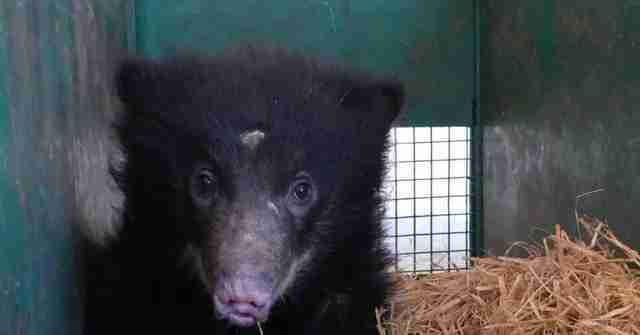 The bear cub is also recovering well - and he's learning to enjoy life again. 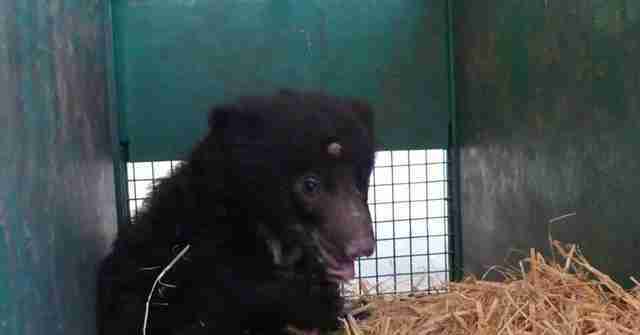 "This poor bear cub has suffered a terrible trauma and will require intensive treatment and care in the months ahead to recover," Alan Knight, CEO of IAR, said in a statement. "I have every confidence in the expertise of our vets and keepers who are skilled in the rehabilitation of physically and mentally damaged bears who have suffered terrible abuse." 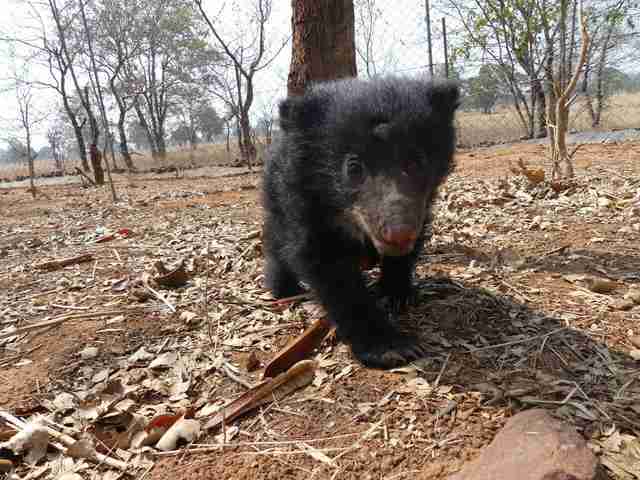 To help this bear cub grow up strong and healthy, and eventually return to the wild, you can make a donation to IAR.